In order to run ParaViewWeb, a rendering environment is required on the machine on which it will be run. There are three ways to achieve a rendering environment, each of which is depicted in the image below. One way is to build ParaView with OSMesa support. 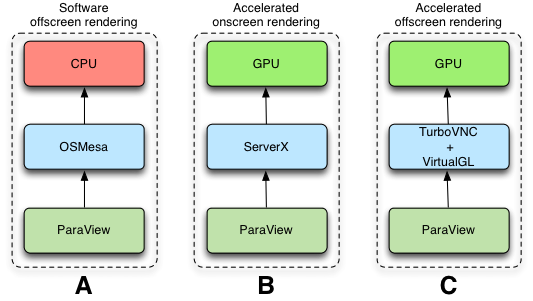 Accordingly, ParaView will perform software rendering (on the CPU) instead of using the screen and any GPU driving it. This is depicted in the image below as approach A. Another approach is to require that the user who will run ParaViewWeb is logged in to the machine, and that this user is running a valid display. In this case, ParaView will use the user’s valid display environment (and the GPU) to perform its rendering. This approach is depicted in the figure below as approach B. The third approach, shown below as C, is to use a virtual display, such as that which is provided by a virtual network sharing (VNC) system. The third approach is the one we describe in this document. Here, we will illustrate how to use VirtualGL and TurboVNC in order to provide a virtual display environment for ParaViewWeb so that it can leverage the GPU. Below is a summary of the instructions for installing, configuring, and testing Virtual GL on Ubuntu 12.04. The original, complete instructions are located here. You will be asked three questions during this configuration. You can arrange things how you like, but for the most secure configuration, you will want to reply in the affirmative to each question. "Restrict 3D X server access to vglusers group?" Yes. "Restrict framebuffer device access to vglusers group?" Yes. The following two paragraphs and intervening code segment are taken directly from the documentation site linked above. If none of the visuals has Pbuffer support, it is most likely because there is no 3D acceleration, which probably means that the correct 3D drivers are not installed (or are misconfigured.) Lack of 3D acceleration is also typically indicated by the word â€œMesaâ€ in the client GLX vendor string and/or in the OpenGL vendor string, as well as by the words â€œSoftware Rasterizerâ€ in the OpenGL renderer string. Here is a summary of how to install TurboVNC on Ubuntu 12.04. The complete, original instructions can be found here. Start the vncserver application, which is probably installed in /opt. Make a note of the display number that vncserver has selected for its display, as it is needed in the following steps. You could also skip the -noauth argument the first time you run vncserver as the user who is in the vglusers group. You will then be asked to set up a password that users will need in order to connect to the vnc session. This is a more secure approach because a user without the password will not be able to connect to the vnc session (e.g. with vncviewer) and see what is happening. By giving the -noauth argument, you forego this password and, thereafter, anyone can connect to the vnc session without any credentials. However, in the use case we are targeting in this document, we do not expect anyone to connect to the vnc session. Using the display number you noted in the previous step, set the DISPLAY environment variable that ParaViewWeb will use during this session. Where display-number is replaced with the actual display number you noted in step (1). Now use the VirtualGL program, vglrun, to start the ParaViewWeb application of interest. Where all the elements in angle brackets, shown above, have been replaced with the correct values. Where display-number, above, has been replaced with the display number you noted in step (1). # frees the display number. # and then run it as "./vglPvRun.sh". echo "Usage: $0 portNumber paraViewBuildDir paraViewDataDir vncServerPath vglRunPath"
echo "   portNumber: The port on which the ParaViewWeb app should listen"
echo "   paraViewBuildDir: The path to the folder where ParaView build dir is located"
echo "   paraViewDataDir: The path the to the ParaViewData directory"
echo "   vncServerPath: The location of the &apos;vncserver&apos; program"
echo "   vglRunPath: The location of the &apos;vglrun&apos; program"
# release the display number. You can copy/paste this script and customize it to run other ParaViewWeb applications or add your own arguments, etc.